Looking for News and Special Promotions? 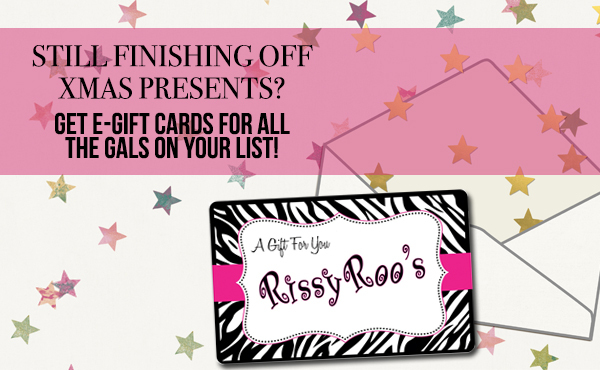 Sign up for our newsletter to stay up to date with all the news here at Rissy Roo's. Free stuff, giveaways, deals, sales, blowout sales and other great promotions are always going on! Need a great dress that wont break the bank? Make sure you always check out our sale dresses and our newsletter for great deals. ** Trend Alert ** Prints Part I: Spotted! Open a fashion magazine lately? If you're reading this blog, I'd assume you have and if you took the time to flip through it, I'd assume you came across a page dedicated to Animal Prints. Animal prints have gained momentum in our wardrobes. First we started with one piece, maybe a cardigan or a tank top. Next came Animal Prints in our jewelry and handbags, followed by shoes and now larger pieces like jackets and dresses. It is only right that we mention that this includes prom dresses. Many people assume that most Animal Prints are leopard. 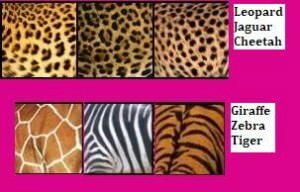 This is an easy error and leopard, without a doubt, has been the most popular, but leopard, jaguar and cheetah are all similar to each other as you can see below. The three are so similar and common that many of us assume one as the other. The chart below can help you to distinguish the difference in prints. Other popular prints this season include tiger, zebra and giraffe. This entry was posted in Celebrities, One Shoulder Dresses, Faviana, Best Dressed, Cocktail Dresses, Evening Dresses, Newsletter, Prom Dresses, Red Carpet, Trends and tagged Jovani, Night Moves by Allure, faviana, Precious Formals, Animal Prints, Rissyroos.com, Leopard, Prom dress, Spring 2011, P10370, 16031, 16270, 16652, 16680, 9416, 6784, Tony Bowls Evenings on January 2, 2011 by Pink Mittens.